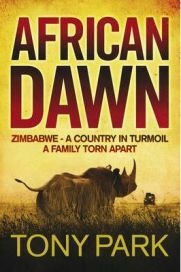 Browsing through new releases by publisher Quercus, a bright and bold cover caught my eye – African Dawn by Tony Park. The saying goes that you shouldn’t judge a book by its cover, but this cover certainly served its purpose in attracting my attention to the blurb, which sounded like a novel I would enjoy. Moving beyond that eye-catching cover design, African Dawn is a novel set in Zimbabwe. Opening in 1959, in what was then Rhodesia, it progresses through the bush war before skipping a few decades to present day Zimbabwe. The tagline says “A country in turmoil, a family torn apart”, but the novel actually concerns three families, whose lives become entwined through choice and accident. The Bryants have a farm where they care for black rhinos and are making a positive contribution to conservation efforts. It is around this farm that much of the action centres. This is a rather vague synopsis, but it would be hard to be any more detailed without mentioning every story thread. The blurb on the back of the book mentions the abduction of Natalie Bryant as a child and her return to Zimbabwe as an adult as being the main story arc, along with rhino conservation, but to me this over-simplifies the novel and over-emphasises Natalie’s place in the story. The story of African Dawn is full on from the very start. It is action-packed and full of intrigue, excitement, plots and tragedy. Park writes very well, without being over-flowery, which would not suit this type of novel, but also without being too plain and simple. He describes life in Rhodesia/Zimbabwe very well, and it seems clear from the central role it has in the novel that wildlife conservation is close to his heart. There are even passages from the point of view of a rhino. One character I particularly enjoyed was Tate, who worked ceaselessly for black rhino conservation – despite being a rather prickly man with other people, his devotion to the plight of the rhino is so strong and sincere that you can’t help but admire him and cheer him on. As for the tragedies in the story, they seem to be never-ending. No sooner have you recovered from one shock than along comes another – and every time it happens you think “no, that can’t be right, he/she can’t be dead, it’s a misunderstanding”. Park builds up the roles of characters and then has tragedy hit, making you realise just how fragile life was in Rhodesia/Zimbabwe during those times. African Dawn is a fictional story, but set during actual events. My knowledge of the conflict in Zimbabwe and previously Rhodesia is, I’m ashamed to say, rather scant, but Park certainly writes with conviction, making me believe the historical details are accurate. There is one moment in particular which is beautifully simplistic but incredibly effective – the introduction of Robert Mugabe as a peripheral character. He has a conversation with another character, and seems like a very reasonable and intelligent man – not until the end of the section do we realise who it is, and the revelation sends a shiver down your spine. I absolutely loved African Dawn, it had my full attention from start to finish – it is a book which deserves the tag of “unputdownable” – I was tempted to deliberately miss my bus stop just because I didn’t want to stop reading. Tony Park has written a number of other novels which appear to be set in Africa, which I am looking forward to reading. While I still mourn the early death of Michael Crichton, one of my favourites, it is refreshing to discover authors such as Park who more than meet my need for exciting, fast-paced fiction. Many thanks to Quercus for providing a review copy of African Dawn. One Comment on "African Dawn"
Your excellent review has me hooked. An historical novel set in the former Rhodesia sounds very interesting.